Ohio’s Appalachian hardwoods are unique in their variety, quality and beauty. Ohio’s forests contain well over 100 different hardwoods and 25 different softwood tree species. Historically, humans have used wood and wood products for shelter, fire, and in war, making wood an integral part of our civilization. We use wood because it is easy to work with, inexpensive, durable, and readily available. Early settlers relied heavily on old growth yellow poplar to make barn siding. Old growth yellow poplar made excellent decay resistance siding for log homes due to the naturally occurring tannins in the wood. Yellow poplar boards were easy to hand hue and resisted warp and shrinkage. Today, yellow poplar is still used for siding due to its availability, low cost, paintability, and resistance to warp and shrinkage, as seen in the photo below. Home built using yellow poplar lumber milled on a portable sawmill from trees grown on a farm in southern Ohio. Photo: Courtesy of Gary Haynes. Physical and mechanical properties between wood species can vary greatly due to the internal structure of each tree. These include size of cells, thickness of cell walls, and chemical composition. Even trees within the same species will vary due to age, growth rate, site conditions, and internal stress within the tree. The lumber from each species of wood has characteristics that will determine its adaptability for various uses. Of these, resistance to decay, ease of working, weight, hardness, color, grain, and resistance to splitting are particularly significant. When selecting lumber for a specific project, consider how the characteristics of the wood species will meet the requirements of the job. For example, joists for a shed should use a wood with good stiffness and bending strength. Since many sheds are not heated, wood with good dimensional stability and the ability to hold nails should also be considered. Once the requirements for the project have been identified, select a wood species with the most appropriate attributes. Often the job requires wood that is decay resistant. Keep in mind that the heartwood found in the center of the log contains less moisture and higher concentrations of decay resistance chemicals than the younger sapwood. This makes heartwood more appropriate for uses such as fence posts. Young trees have a higher percentage of sapwood than older trees; therefore, small poles and saplings would be almost worthless as posts if used untreated. On the other hand, sapwood, because of its light color, greater flexibility, and lighter weight, is preferred to heartwood for items such as tool handles and siding. If you plan to use wood from your own woodland, the trees must be felled, transported to a sawmill, cut into boards, and dried. If you don’t have your own sawmill you can hire a portable sawmill to come to your property to saw and stack your lumber. There are also many small sawmills that will do custom orders. Look in your local yellow pages or talk to your local Extension educator or service forester for suggestions. A listing of large and small sawmills by county is available online at oardc.ohio-state.edu/ohiowood. 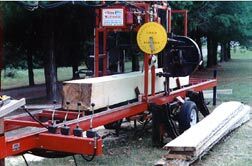 Portable sawmills are often used to saw trees into lumber from small woodlots. Photo: Courtesy of Gary Haynes. For many projects, properly air-dried lumber is sufficient. However, wood used in dry, heated environments will either need to be kiln dried or allowed to dry in a similar environment before being used. 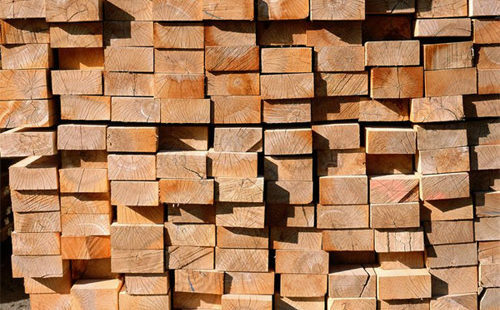 When air-drying alone, lumber can take several years to get to a 15%–20% moisture content depending on thickness and species. If you don’t want to wait or don’t have the storage capacity, lumber can be purchased at wholesale prices if you order in bulk, or you can take your lumber to one of several custom dry kilns in the state. Building codes vary from state to state, county to county, and even from township to township. So before building any structure, check with your local building inspector. If grading rules exist you will need to hire a professional grader to inspect any non-graded lumber or buy graded lumber for load bearing members. If there is no grading requirement, check with your insurance company to make sure you can get homeowner’s insurance for your house if it does not use graded lumber. Ideas and building plans can be obtained from the Midwest Plan Service (MPS) and the Northeast Regional Agricultural Engineering Service. Lumber milled from Ohio’s woodlots are great sources for woodworking and wood frame building needs, as well as many other uses. The species selected depends on the intended use. When considering need, your decision should be based on selecting the species with the most desirable properties for the job. For example, black locust makes great fence post since the heartwood is highly resistant to decay and has good bending strength and excellent nail holding capacity. White oak is an excellent material for water tanks and silos due to its strength and impenetrability to liquids due to a crystalline structure in the wood’s membrane called tyloses. Table 1 describes the usual requirements for various building components. Keep in mind that lumber quality and strength can vary, and it is important to select pieces of lumber that do not have defects which can alter the property of interest. Although Ohio’s forests contain many different species of trees and shrubs, there are only twelve groups of hardwood species that make up the core group of hardwoods grown and sold in North America. These species are commercially important due to the volume in which they occur in the forest and their wide variety of uses. Table 2 outlines the unique characteristics and uses of these species. For help identifying the trees in your woodlot, two excellent references are Ohio State University Extension’s Leaf Identification Key to Eighty-Eight Ohio Trees and The Audubon Society Field Guide to North American Trees, Eastern Region. Ohio forests and wood lots also contain many other types of hardwoods, each with their own unique traits and uses. These species allow the woodworker or builder to take advantage of interesting colors, grain patterns, and other traits for woodworking or building projects. 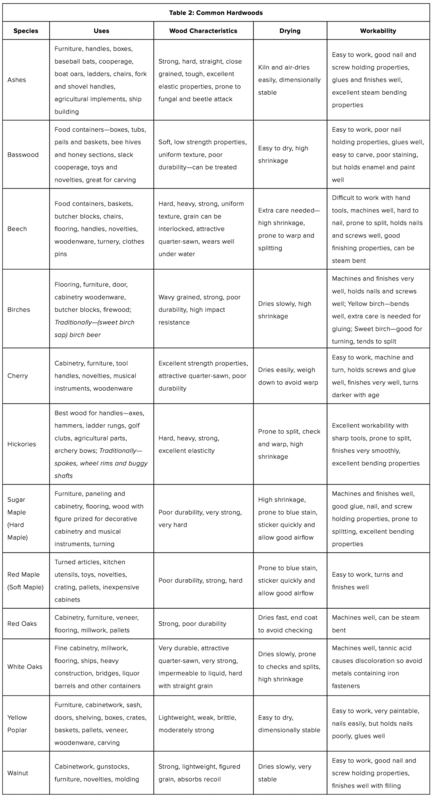 Table 3 contains a list describing some of the less dense (soft) hardwoods found in Ohio. Sassafras is one of those species. Even though it is very lightweight and soft it is surprisingly decay resistant. Table 4 lists the more dense (hard) Ohio hardwoods. Osage-orange is one of the hardest/densest of American hardwoods and while very difficult to work is easy to dry and is excellent for turning. Although Ohio’s forests are mostly known for their hardwoods, less than 5% of Ohio’s forested land contain softwoods. 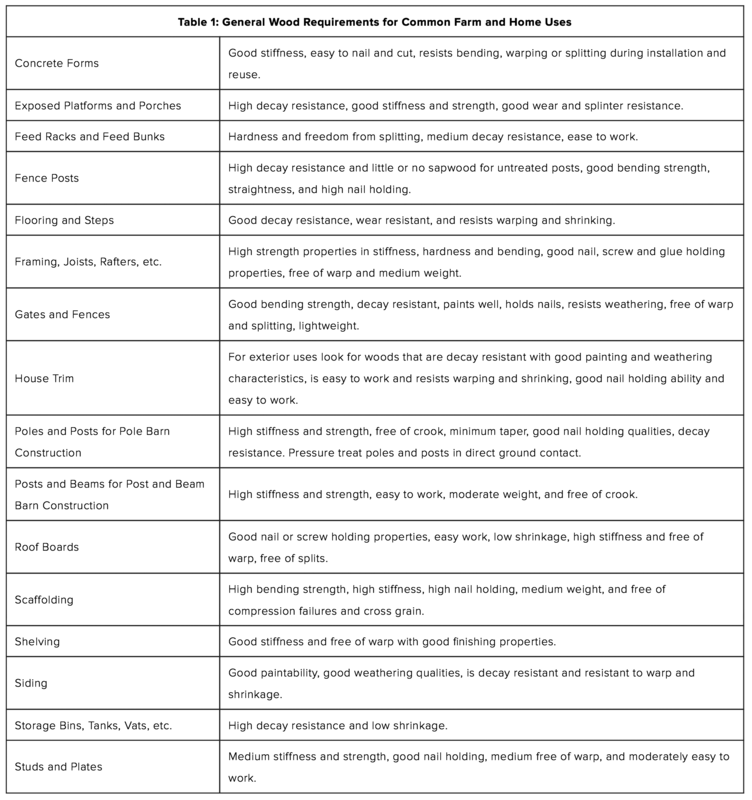 Table 5 describes the four most commonly found softwoods and their uses. Eastern white pine is the most common and is almost always grown in plantations. While Eastern white pine is a very valuable commercial species in most of the Northeast, markets are currently very limited in Ohio, with most logs being converted into paper pulp. Eastern red cedar has some very good local markets and is most often used for outdoor furniture, birdhouses, and cedar chests. A Guide to Useful Woods of the World, Second Edition, by James H. Flynn and Charles D. Holder, eds., Forest Products Society, Madison, Wisconsin, 2001. 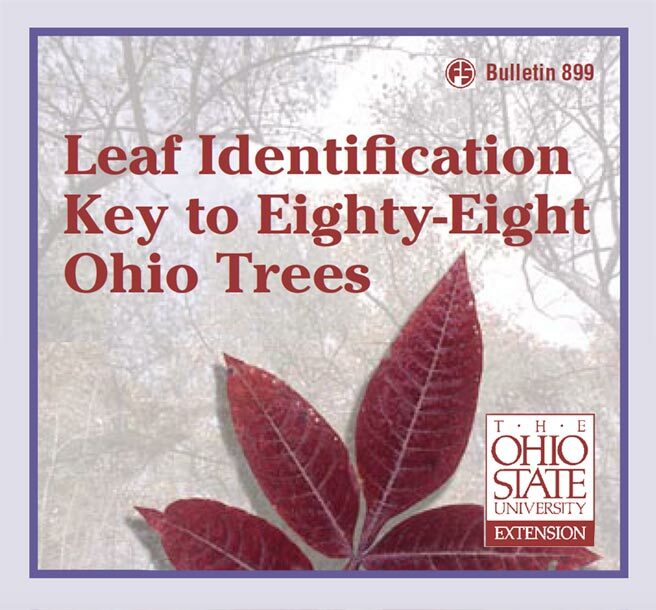 Leaf Identification Key to Eighty-Eight Ohio Trees, Bulletin 899, by David K. Apsley and Kathy L. Smith, Ohio State University Extension, Columbus, Ohio, 2002. Lumber From Local Woodlots, NRAES-27, by Robert L. Edmonds and Stanley W. Knowles, Northeast Regional Agricultural Engineering Service Cooperative Extension, Ithaca, New York, 1988. Ohio Trees, Bulletin 700, Agdex 300/30, by L. C. Chadwick, William F. Cowen and F. W. Dean, Ohio State University Extension, Columbus, Ohio, 1990. The Audubon Society Field Guide to North American Trees, Eastern Region, by Elbert L. Little, National Audubon Society, Inc., New York, 1993. Understanding Wood: A Craftsman’s Guide to Wood Technology, by R. Bruce Hoadley, The Taunton Press, Inc., Newtown, Connecticut, 2000. Wood Handbook: Wood as an Engineering Material, USDA Forest Service, Forest Products Laboratory, General Technical Report—113, Madison, Wisconsin, 1999.